What happens when we spend periods of timing sitting? Well, to start with, sitting requires less energy. It’s estimated that calorie burning drops to as little as one per minute, about 30% less than standing – and this is without any additional moving about which tends to occur when we stand doing tasks. As less energy is needed the metabolic rate drops which, in turn, reduces enzyme and good cholesterol levels. Research has found that it also reduces the effectiveness of insulin which, long term, has been linked with an increased risk of diabetes. At the same time – however good your posture is to start with – the lower back muscles gradually become less active. You start to slump and your internal organs are displaced, so function less efficiently than when you’re standing. To compensate for this, the ligaments and discs have to work harder. Sit in the same position for any length of time and the abdominals become weaker, increasing pressure on the lower back. This, together with the shortening of the hip flexor muscles – deep internal muscles running obliquely from the lower back and down into the groin – play a major part in lower back and hip pain. More often than not, clients with lower back pain will have been sitting for long periods of time and this includes those who do a lot of driving. Sitting can also play a part in Sciatica – nerve pain originating in the lower back and travelling down the back of the leg – as electrical activity in the legs is reduced by long periods of sitting. Lack of movement and exercise is, not surprisingly, also linked to an increased risk of cardiovascular disease. Interestingly research at Leicester University found that simply increasing the amount of exercise, without reducing the time sitting, didn’t seem to reduce the risk. Sitting for 6 hours or more a day was found to increase the risk of dying within 15 years by 40%, compared with someone who sits for fewer than three, even if you take regular exercise. Not surprisingly, the answer is quite simple. Move more, don’t become a statistic! 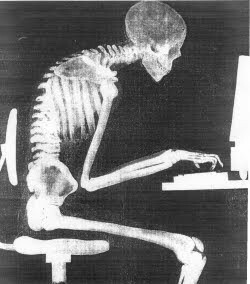 Our bodies are designed to be active, not to be sitting in one position for any length of time. The general advice is to minimise sitting, ensuring that you get up every half an hour to move, stretch and have a drink of water. If you can’t leave your desk, at least stand up and have a stretch. Making exercise a regular part of your day is much easier than trying to fit in a trip to the gym. Walking up the stairs and parking a little further away from where you need to be all make a difference. Standing desks and so called “dynamic office chairs” can also play a part, used by an increasing number of companies. Interestingly, standing desks have also been found to increase concentration and productivity – or perhaps it’s that people want to finish the task in hand and sit down for a rest (!). Even so the need for regular movement is emphasised, as standing still in one position for long periods of time, carries its own risks. And don’t forget the sitting you do at home too. Do you really need to spend so much time in front of the “one eyed monster”? If there’s a programme you really want to watch, get up during the commercial breaks rather than staying slumped on the sofa. Oh and how about forgoing the favourite snack you usually munch on as well?!? Increasing the food you eat, when doing less, simply doesn’t make any sense at all. Our more sedentary lifestyle plays a major part in many modern health problems, not least obesity and diabetes; for both adults and children. Building a little more activity into your day can be done easily, improving your health and quality of life.